Lee (Carpenter Oak’s Chairman) and Mike had carried out renovation work on two of their previous properties. The most recent of which included a Carpenter Oak garden room extension. 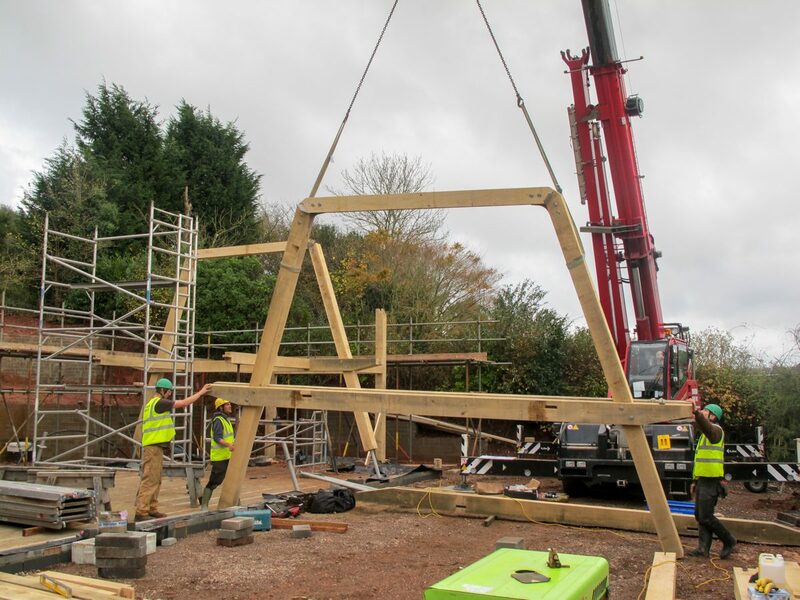 With a want to move into a detached property, they started exploring self-build as an option. To start searching for a plot, Lee set up alerts on Rightmove. Unusually, he chose not to register with Plotfinder. Lee felt it was specific for people wanting to self-build and was a competitive market. 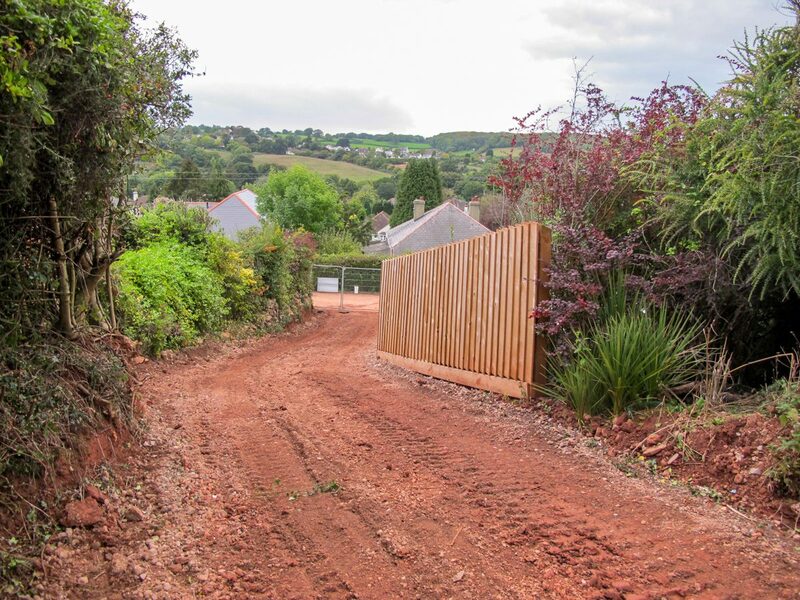 “With Rightmove being a more open market, people didn’t appear to be putting offers in on the land” recalls Lee. Lee searched for several years before securing the plot. He’d been watching it for some time and eventually, the price fell to within their budget. While the plot was not perfect, it satisfied most of Lee and Mike’s needs. The plot is set amongst buildings, meaning that the future of the landscape is already determined and little can change in the future. This future-proof aspect of the plot helped to feed into the design of the house. The position of the plot feels secluded, even amongst other homes, with a private gated entrance, it is not obviously noticeable. “It’s a little bit like platform 9 ¾ from Harry Potter” laughs Lee. With a plot in mind, accessibility is essential to consider. Access was tight at Lee and Mike’s plot but there was just enough space for the crane to get in. Once the land was secure, Lee looked at getting a mortgage in principle. He used the Carpenter Oak project ‘A Cornish Retreat’ as a benchmark. Working with the costs based on that project, Lee was able to determine what was achievable and expand upon it. 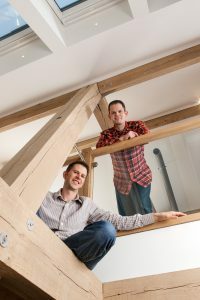 WIth their budget in mind, Lee and Mike then approached Build Store, who secured them a mortgage with Bath Building Society. The next stage was for Lee and Mike to approach an architect. They chose to work with Roderick James Architects, whom they had worked with on their previous garden room extension. Roderick James Architects have a long history of working with Carpenter Oak and Lee and Mike respected their design and guidance. 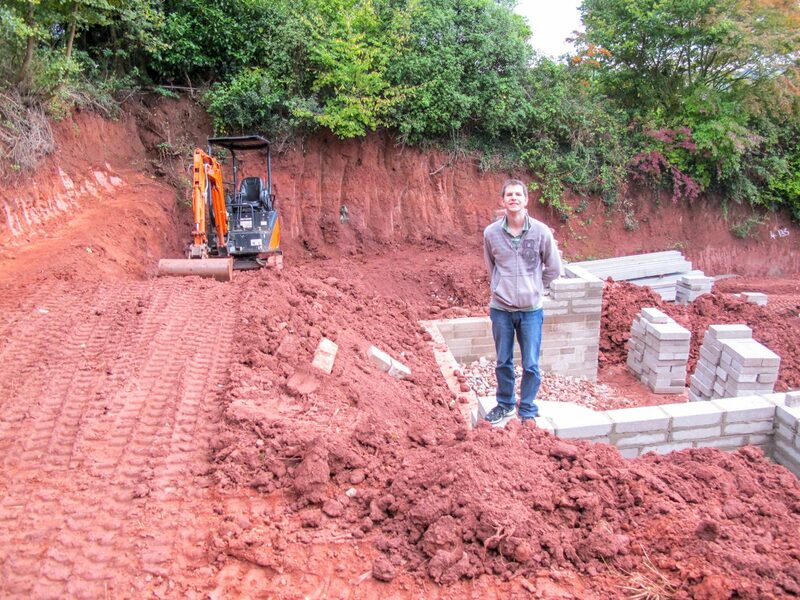 Lee and Mike wanted to build a detached house in a secluded area with a garden and parking. They had no particular size in mind. Their three-bedroom home was achieved on just under a ¼ of an acre of land. The land came with full planning permission for a bungalow, which Lee and Mike discovered had received objections to elements of the design from neighbouring homeowners. Lee and Mike approached the neighbours and were able to redesign the home with their objections in mind. When Roderick James Architects submitted the planning application, it went through with no objections and approval from the Parish. Lee and Mike were originally looking for a block build construction to complement the style of frame that they wanted. Throughout the design process, it became apparent that they wanted to include more eco features and produce an energy efficient building. This desire resulted in the couple moving away from blockwork construction and towards Structural Insulated Panels. 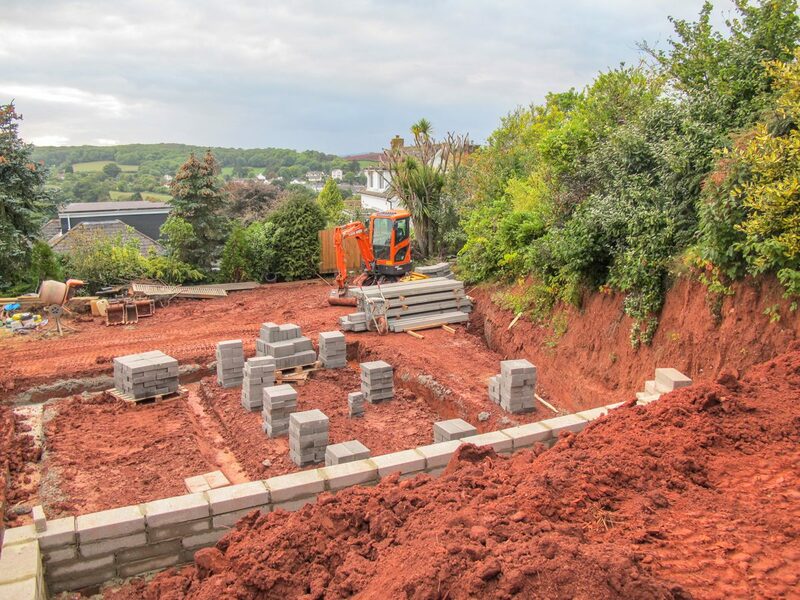 The change in construction method meant that they designed out a traditional block built larder – a feature that Lee would choose to keep if they were to do it again. If they were to reconsider construction methods, they would look at an all timber solution, maybe to include Laminated Veneer Lumber panels and a move away from plasterboard. They would also consider exposed wiring conduits and copper plumbing that is designed to be attractive while being purposeful. “We’d also looking at utilising waste products such as pallets for cladding internal walls” suggests Lee. 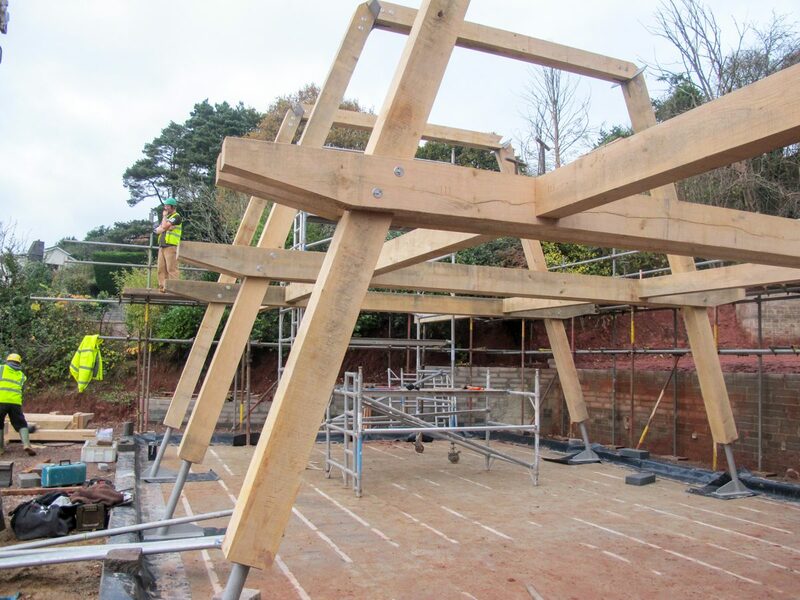 Carpenter Oak was the obvious choice for the frame and then they approached trades they had worked with before on previous projects, including the SIP’s company and engineering company. The builder involved on the ground works came recommended and they subsequently took on most of the building work. “It was an organic process” recalls Lee. Lee acted as project manager, attending the site for three hours in the morning, twice a week. Working from his laptop in the car Lee stuck to a regular routine. This meant that people knew when and where he would be. Outside of this time, he responded to texts and emails. 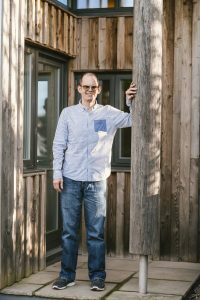 Although Lee project managed his own self-build, he feels there is enormous value in appointing a project manager, believing that you won’t spend any more money. Had he not worked in the industry, Lee thinks that task would have been much harder. “It was definitely made easier by who I knew and not what I knew. I don’t think I’m highly skilled as a project manager,” says Lee. 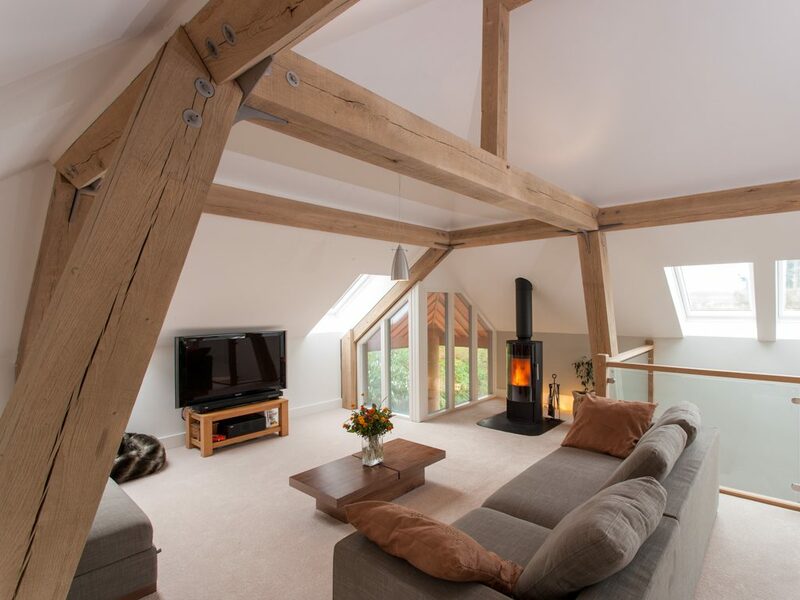 Having lived with their garden room frame Lee and Mike knew that their self-build project had to include an oak frame as the main feature. They were keen to explore the boundaries of traditional framing to create a unique and contemporary structure. 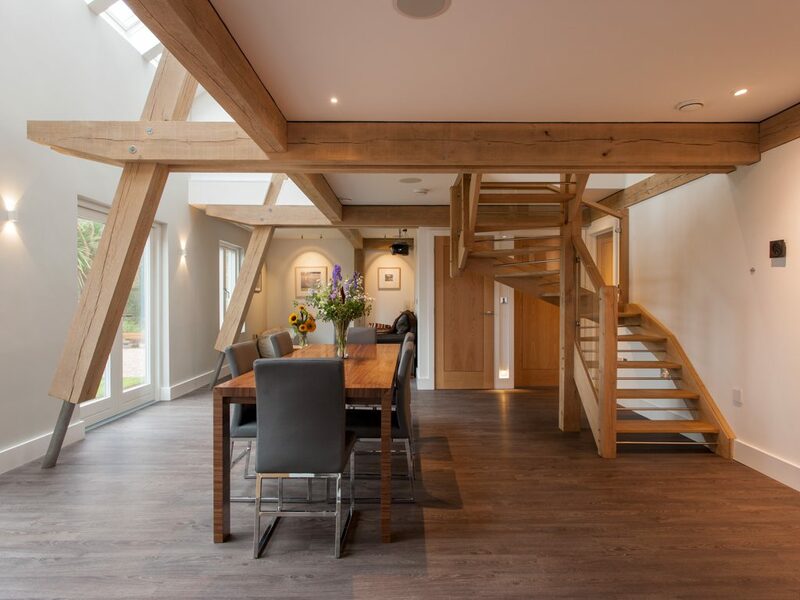 The contemporary oak frame was utilised adeptly and intentionally kept to a minimum, with no diagonal bracing, bottom plates, joists or top plates. The three main cross frames are the main feature of the home, with the main posts slanting inwards to create large ‘A’ frames. Dramatically ending two feet above the finished floor, the posts then land on large stainless steel feet which continue at an angle into the floor. 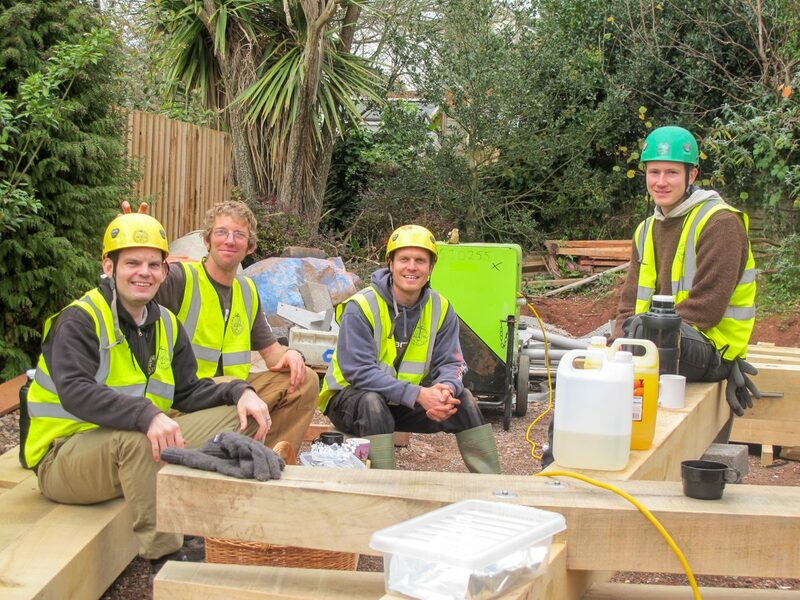 For each stage of the project, Lee and Mike listed their ‘must haves’, ‘like to haves’ and ‘if there’s money left’. They could review each stage of the project before continuing onto the next. They covered all their ‘must haves’ and around half of their ‘like to haves’ but didn’t achieve any extras. 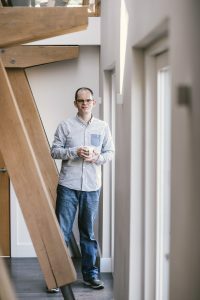 Lee wanted to make the stressful event of self-build more fun, this way of managing budgets was one way of achieving that. The end result was that they stayed very close to their initial budget with an overspend of only £5000. With the plan to move in and let out their existing property it meant the house was almost complete when Lee and Mike moved in. The only thing left to fit was only the glass balustrading. “Had we any children it wouldn’t have been possible to move in at that time” says Lee. “We had only been renting out our previous property for six months before the tenants wrote to us offering to buy the property…..their reason? The Carpenter Oak garden room extension” smiles Lee. For Lee and Mike, apart from the oak frame, lighting was their most important must have. Lee feels lighting becomes more important as you get older. There is a need to distinguish ambient lighting from task lighting. 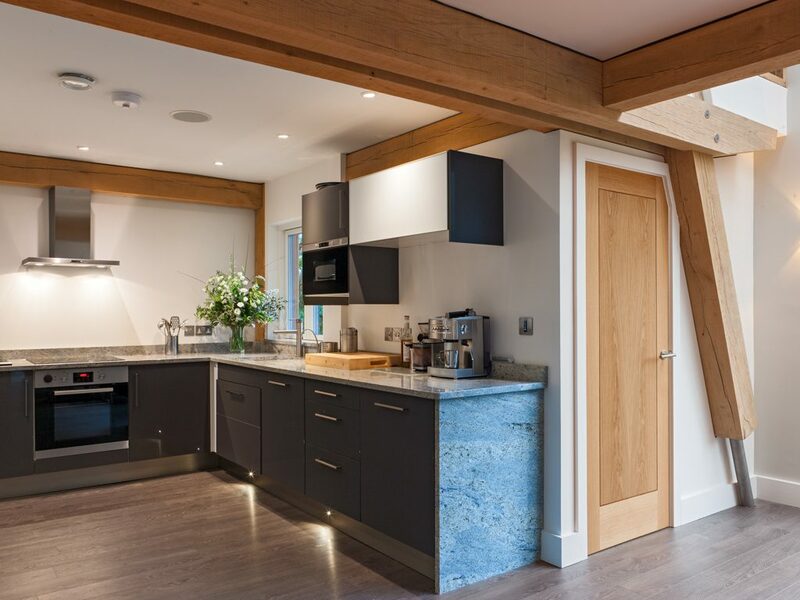 “Lighting can transform a space, Carpenter Oak buildings are amazing and deserve great lighting, if you get it right the wood sings”, adds Lee. Lee and Mike had a complication with the render on the building and as project manager, Lee had to unpick this problem himself. “It’s difficult to rectify the problem without blaming someone,” says Lee. In the end, Lee found and resolved the issue. Lee and Mike are now planning a renovation, a restoration and a new build project in Canada. View the case study for Lee and Mike’s Orchard House, also known as Carpenter Oak’s show home.